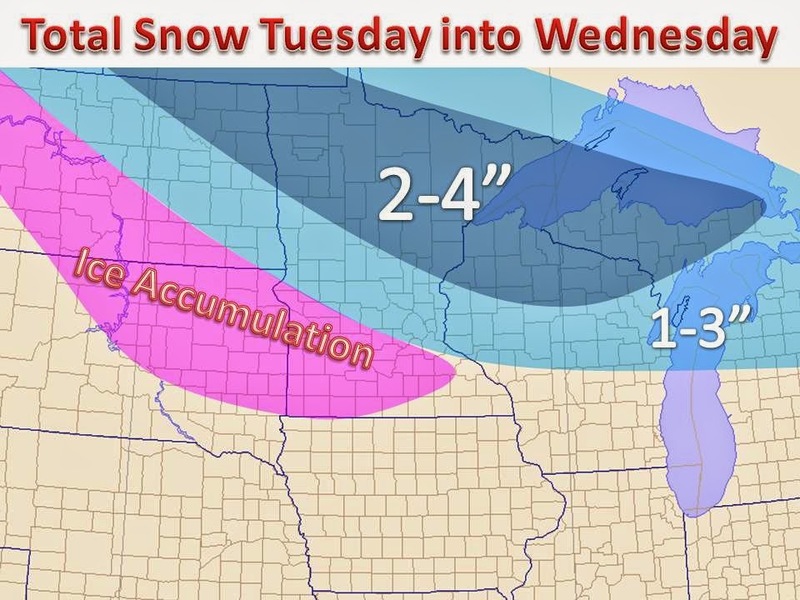 A weak system will bring a few inches of snow to the upper Midwest starting Tuesday afternoon and lasting into Wednesday, depending on your location. Nothing to major, as much of the snow will come Tuesday night, with the exception of Minnesota, where the snow will begin Tuesday afternoon, which could lead to a slick rush hour near Minneapolis. Total snow amounts are mapped out for you. Winter weather advisories are now in effect, mainly in our 2-4" band. Meanwhile, freezing rain will impact areas where warm air aloft will work in as the precipitation shield is still in place. Those areas are in pink, much of this area is under a freezing rain advisory.